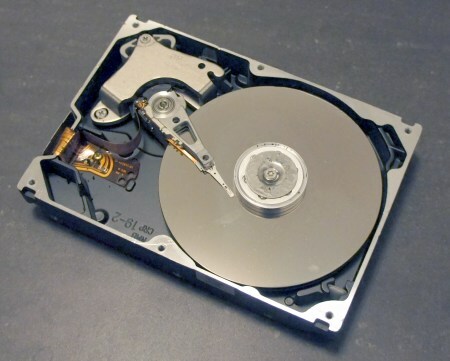 Solid state drives look surprisingly simple under the cover. If it wasn’t for the 2.5″ form factor they inherited from ordinary drives, they could probably be both smaller and lighter than today. 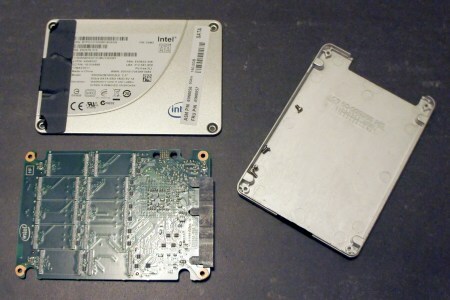 Shown here is a 160GB Intel SSD. The die cast aluminium casing is surprisingly thin and light. It is held together with four small screws, some of which are covered by do not void stickers. 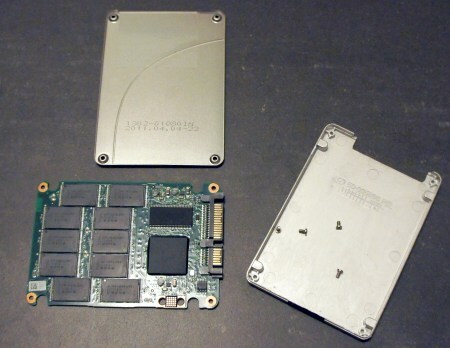 The 10 large chips comprises the actual storage, 16GB each. The two other chips are controllers for the storage and SATA interface. There seems to be space for 10 more chips on the other side, presumably they are reusing the same PCB for a 320GB version of the drive. Comparing this to an old style 3.5″ drive, noting the number of components and lack of moving parts, it seems obvious that the price and capacity of these babies will be going in opposite directions fast. Just don’t forget backups!